Despite intense research involving embryonic stem cells, relatively little is known about how adult stem cells make their cellular lineages or the ways in which this process can go awry, possibly contributing to the development of diseases such as cancer. 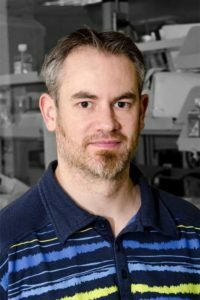 Dr. Bret Pearson’s lab is trying to understand the connection between adult stem cells and cancer by using the freshwater planarian as an in vivo model system. Recently, researchers in Pearson’s lab have cloned planarian homologs of human disease genes, removed their function in adult stem cells and assayed changes either in the stem cell population or in lineage output. They recently showed that the p53 tumour suppressor pathway also functions in planarian stem cells to promote differentiation while suppressing cell division – similar to how p53 functions in mammals to suppress cancer. This suggests that planarians are a relevant model system to understand human stem cell biology and dysfunction. Currently, the lab employs both standard and high-throughput approaches to discover new regulators of adult stem cells. Ultimately, Pearson will apply information from these discoveries into therapies designed to target new genes involved in cancer development across a wide array of stem cell driven cancers. Director, Collaborate Specialization in Developmental Biology, University of Toronto. Swapna LS, Molinaro AM, Lindsay-mosher N, Pearson BJ, Parkinson J.
Int J Dev Biol. 2018; 62(6-7-8):527-535. Curr Opin Genet Dev. 2016; 40:74-80. See Dr. Pearson’s recent publications on PubMed or on Google Scholar. Fred Hutchinson Cancer Research Center, Harold M. Weintraub Graduate Research Award, 2005. Research Technician, University of Wisconsin-Madison. Laboratory of Dr. Nansi Jo Colley. Dr. Pearson welcomes collaboration. Please contact him directly for more information.